Are you in need of a last minute gift idea? Don’t worry, I have the solution for you guys. 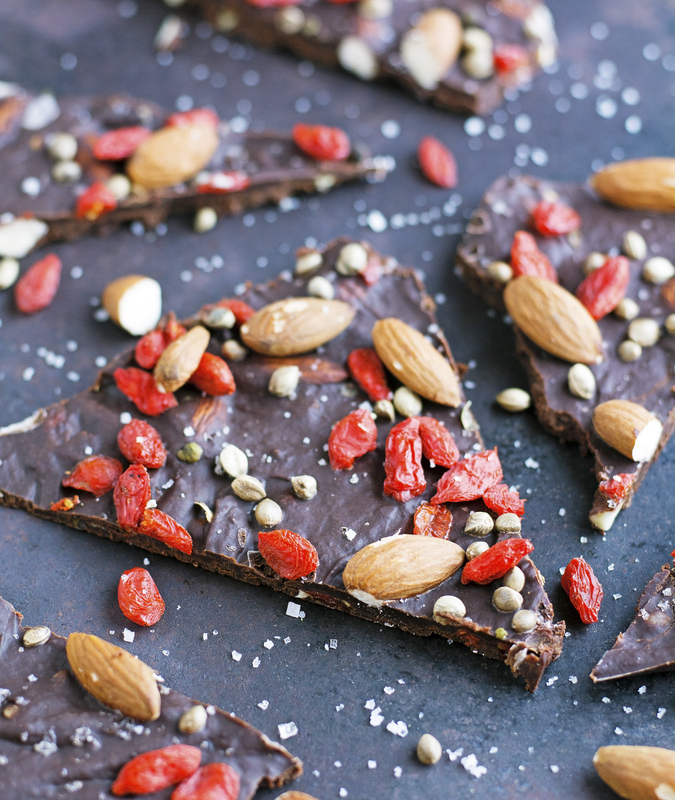 This Loaded Superfood Chocolate Bark is the perfect festive present. A ridiculously easy no-bake treat with Medjool dates, almond, goji berries, hemp seeds, and sea salt flakes all embedded into dark chocolate. It’s salty, sweet, and crunchy with so much texture and so much good-for-you stuff in every bite. The perfect healthy-delish present or for impromptu holiday parties. Can I just state the obvious? 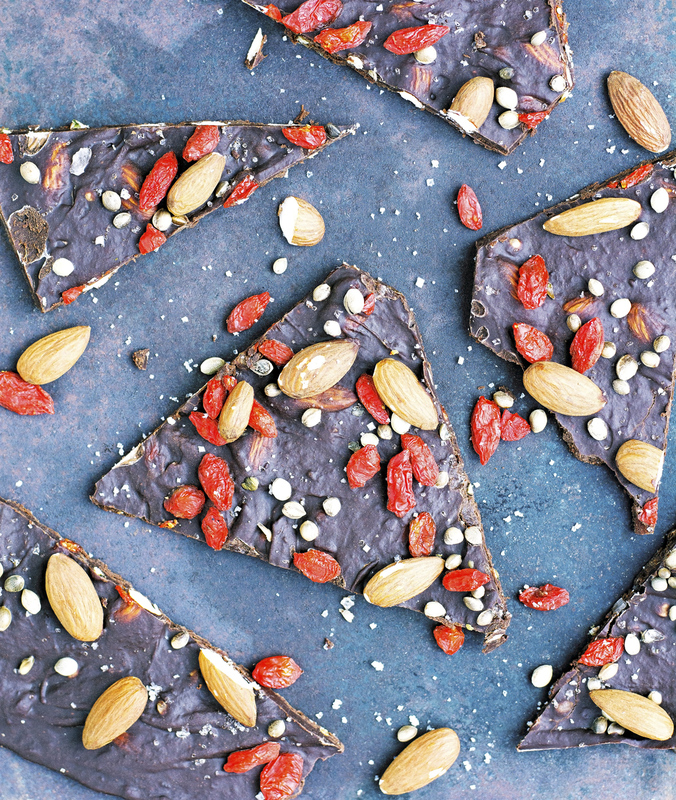 This superfood bark is supa-dupa-good. Dates and goji berries give some extra sweetness to dark chocolate, while almonds and hemp seeds add that extra crunch we all love. Not to mention hemp seeds look awesome sprinkled throughout and add some extra superfood oomph. Salt always always goes well with chocolate. Rich dark chocolate, salted, loaded with flavorful and colorful superfoods — perfect for any holiday party or year round treat. 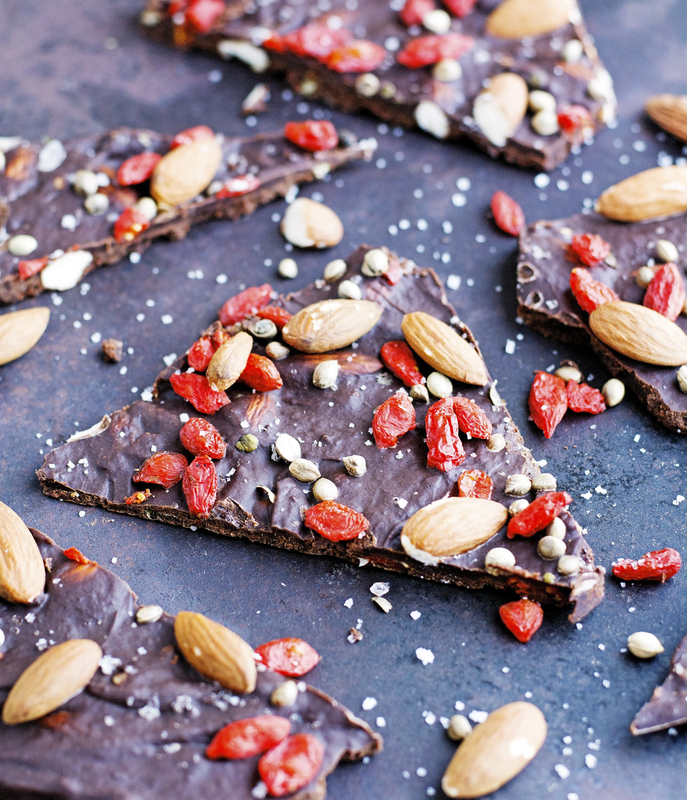 Loaded Superfood Chocolate Bark Print this recipe! Note The recipe can be easily doubled, tripled, quadrupled, etc. Not to mention you can tweak it as much as you like. Be creative! Line a baking sheet with parchment. Set aside. Using a sharp knife roughly chop the dates. Place a medium size heatproof bowl over a pot of barely simmering water, making sure that the bottom of the bowl doesn’t touch the boiling water. Add chocolate, stirring until melted and fully combined with date paste. Remove from the heat and with the help of a spatula fold in ½ cup of almonds, ¼ cup of goji berries, and 2 tablespoons of hemp seeds. Spread onto the prepared baking sheet in an even layer to desired thickness. Scatter remaining almonds, goji berries, hemp seeds, and sprinkle a couple of pinches of salt flakes. Using a small spoon, gently press down the superfoods into the chocolate. Refrigerate the bark for about 30 minutes, until hardened. Invert the bark onto a work surface. Remove the parchment paper, break into pieces and store in an airtight bag or container in the refrigerator for up to 2 weeks. I love this! These would make even my health-freak friends happy! Looks amazing. I'd have to sub the almonds, but that's easy enough. Merry Christmas Mike! Love how festive this looks, and I will go crazy for all the textures in one bite. Hope you had a nice Christmas! Easy and delicious.. happy new year! This looks amazing Mike, and it is super healthy too. Love it!